40,000 Walk for Lifer's an UNDERCOUNT? For those who have not heard of him, Zombie is a well known San Francisco photojournalist and reporter, who records many demonstrations in the Bay Area. Don't let the name fool you, "Zombie" is a serious man. He has been pivotal in a number of exposès that were then followed up by the mainstream media: "Anatomy of a Photograph", "Obama's Science Czar," etc. Zombie, who describes himself as "mostly pro-choice" attended the Walk. His testimony as to the number of attendees is significant because first, he is not on our side, and secondly, because he has more experience covering San Francisco demonstrations than just about anybody. Walk for Life had over 35,000 attendees pre-registered before the rally, and on-site estimates placed the final number of attendees at probably closer to 40,000, which from my vantage point actually seems like an under-count. 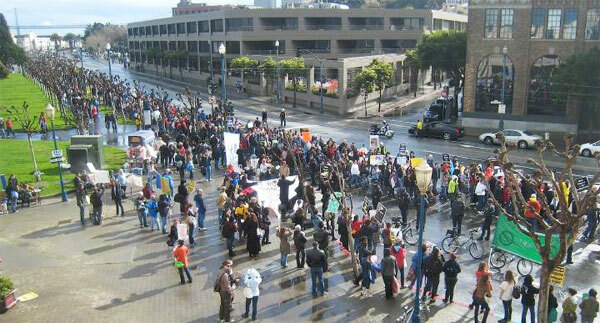 The question then becomes: Why did basically no one on the pro-choice side show up, aside from a few demented radicals? I can only imagine that the answer is this: That every liberal in the Bay Area is already so confident that the status of abortion in this country is unchangeable and safe as a permanent socio-political fixture to such a degree that they feel it isn’t worth defending, since it’s not really under threat. What else could explain a 500-to-1 disparity in pro-life vs. pro-choice protesters in the most liberal area of the United States? But if 40,000 people come out to rally against something you take for granted while only a handful stand against them, perhaps you shouldn’t take it for granted any more. Or could it be that the support for abortion in the Bay Area is not nearly as strong as it once was? In this new America, anything is possible.